the harmon squad: i am an introvert. I recently saw this photo somewhere online and screamed "YES!!!" in my head. Pretty much everyone knows what an introvert is, but few understand what that means. It goes beyond simply being a "homebody" or "quiet." Some of these things I didn't even know, but after reading it was like parts of me and my life suddenly made sense. 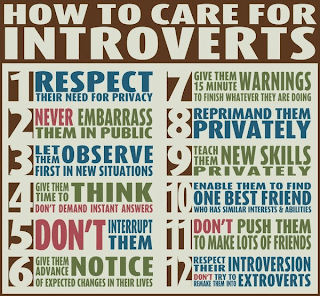 In addition to being an introvert, I'm also really shy. Which I think is typical, the two seem to go hand in hand. But I'm finding more and more that it is no longer socially acceptable to be shy or an introvert. Or at least, not the first thing people think of when they meet someone who is. Instead people automatically assume you are "haughty" or "aloof." When in reality you are just afraid of them. And just need time to warm up to new people and places. So don't give up on us! Anyway, I hope this poster gives some insight into how to deal with us quiet folk. As the mom of a couple children who are proving to be just as introverted and shy as I am reading a few of these points came at just the right time. I just listened to a book entitled, "Quiet, The Power of Introverts in a World that Can't Stop Talking", by Susan Cain. I wanted to shout on the rooftops for everyone to read it. It was wonderful. The author seemed to know me even better than I know myself. We introverts are really quite astounding people! Thank you for this. 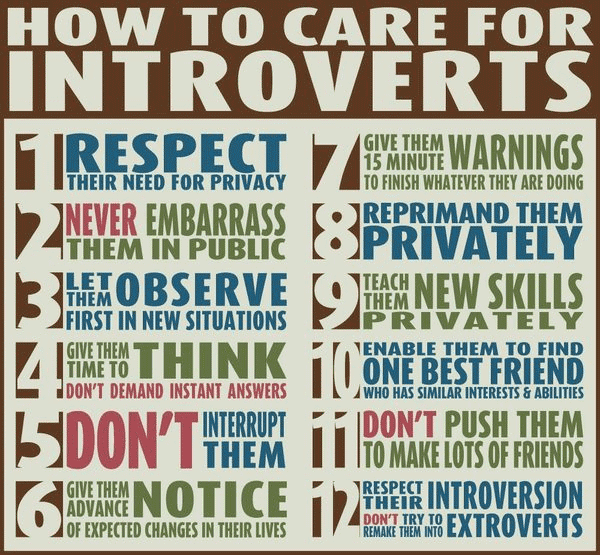 I am realizing that my sweet Caroline is an introvert and this will help me so much.